The CEPEC sports complex will have sufficient facilities to host a variety of equestrian events and venues including: Move cursor over image to view description. 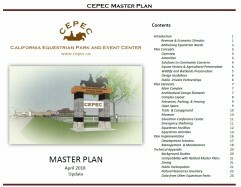 CEPEC's facilities will include custom arenas, coliseum, pavilion, polo fields, cross country course, driving course, trails, conditioning track, a surgery and imaging center, a farrier center, museum, habitat preserve, education/conference center, gift shop, picnic areas, and horse/rider campground. CEPEC is partnering with Sonoma State University to create academic accredited equestrian programs, the American Red Cross to create an emergency mega-shelter for horses and people, the Sonoma County Museum to preserve and display equine historical and artifacts and art, as well as Junior Achievement to create shadowing programs for youth.